Phonetics Lost a distinction between long and short vowels, developed several new ones, like y (a sort of unlabialized [u]). No diphthongs remained. A rich system of spirant and other sibilant consonants, each stop has a palatal variant. The stress is free. Nominal Morphology Rather an archaic structure of the nominal declension, including the declension of adjectives, numerals and pronouns. The noun has 6 cases (nominative, genitive, dative, accusative, instrumental and locative), 3 genders and 2 numbers. The 'ablaut' mutation is widely used in the roots (sestra 'a sister', sjostry 'sisters'). Adjectives can have both short and full (pronominal) forms, but the latter seems much more productive. Personal, possessive, interrogative, demonstrative and other pronouns are also declined, their type of declension differs a little from that of the nouns. Verbal Morphology The verb has got three tenses (present, past, future), though their formation is different from the Old Russian language: the past tense uses the forms of the ancient participle ending in -l (delal 'did') which can not be conjugated. The future tense is formed either analytically (budu delat' 'I will do') or uses the present forms of the verbs of the perfective aspect (delaju 'I do', sdelaju 'I will do, I will have it done'). The aspect plays a very important part in the language, there are two of them - perfective and imperfective. The distinction in aspect is preserved in all three moods, indicative, subjunctive- conditional, and imperative, and in participles, both adverbial and adjectival, the latter being either passive or active. The verb is conjugated using two numbers, 3 persons. Prefixed verbs are used widely for forming tints of meaning and aspect. Lexicon The basic fund of the Indo-European lexicon was preserved in Russian. There are also a lot of words borrowed in different times from German, Polish, Iranian, Turkish, and in the contemporary language from English and French. Still, the vocabulary remains quite archaic. A typical feature of Russian vocabulary is large families of words derived from the same root by means of various prefixes and suffixes. History Russian is one of direct descendants of the Old Russian languages spoken by East Slavs in the 8th - 13th centuries. 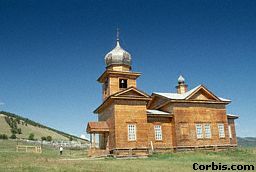 Since the 15th century Russian is spread over Siberia, the Far East, penetrates into the Caucasus and Central Asia. Today it is one of the most widely spoken languages in the world, one of the five official languages of the UN. Close Contacts Among Indo-European languages, is quite close to Baltic languages, especially to Old Prussian, and to Germanic. Suffered a great influence from Turkish languages in the 13th-15th centuries, then had close contacts with European languages (English, German, French, Italian, Polish). Sample Vo dni somnenij, vo dni t'agostnyh razdumij ty odin mne podderzhka i opora, o velikij, moguchij, pravdivyj i svobodnyj russkij jazyk.